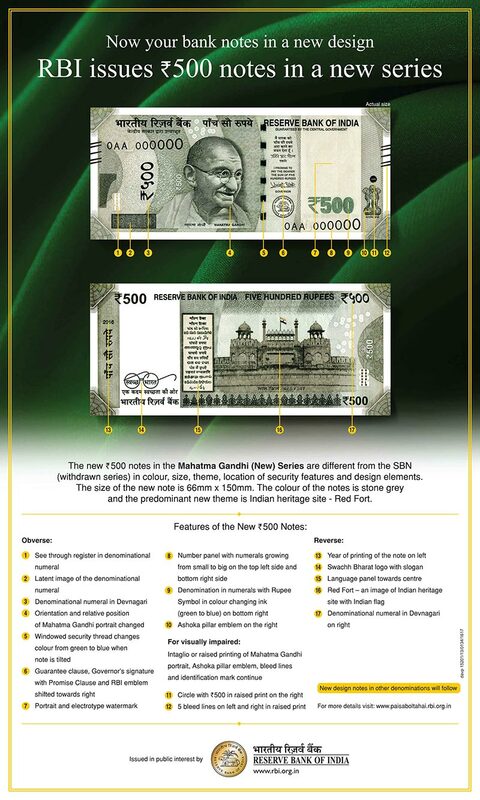 The Reserve Bank of India will shortly issue ₹ 500 denomination banknotes in Mahatma Gandhi (New) Series with inset letter ‘L’ in both the number panels, bearing the signature of Dr. Urjit R. Patel, Governor, Reserve Bank of India, the year of printing '2016’ and Swachh Bharat Logo printed on the reverse of the Banknote. The banknotes issued earlier vide Press Release No. 2016-2017/1146 dated November 08, 2016 will continue to be legal tender.